Social workers should be viewed as extremely valuable employees as far as local communities and society in general are concerned. A social worker is responsible for working with people of all ages who are in some way socially excluded, vulnerable or undergoing some level of crisis. The role and duties of a social worker are broad and varied, but generally include the provision of guidance and support, in order to enable service users (the people they help) to eventually support themselves as much as possible. Social workers are employed in a variety of environments, with some working in schools, local education authorities and hospitals, and others working within voluntary organisations or in an individual's own home. Social work can be a stressful career, you need to be well organised as there is a significant level of administrative work - and time management skills are crucial. A social worker is expected to assess, review and maintain records of specific cases, all within certain timeframes whilst achieving set standards of care and providing service users and their families with the help they need. The ideal social worker will be caring by nature, with an ability to empathise and communicate with those around them, particularly those who may be hard to deal with, such as the vulnerable and disaffected in society. You'll need to be fairly tough to cope with all this and you will also be up against many other organisations in trying to achieve the necessary help for those you are supporting. To become a social worker, you will need a social work degree. The degree course takes 3 years to complete in England, Wales and Northern Ireland - and 4 years in Scotland. Before being accepted onto a social work degree course, you will need to demonstrate that you understand what social work is about and have had some kind of experience in social work or social care. Your previous experience could be paid work experience in a related field such as a carer or it could be voluntary experience within a care or social work setting. It will help you to assess your own strengths and weaknesses, as well as providing an understanding of just what sort of work is involved in a career as a social worker. At some universities this requirement can be higher. You will need to check the requirements at the university of your choice. In Scotland, you will need at least 4 Highers and in Northern Ireland a minimum of 3 B-Grade A-levels. Can I Study While I am Working? The previous qualifications necessary to become a social worker were the Certificate in Social Service (CSS), the Certificate of Qualification in Social Work (CQSW) and Diploma in Social Work (DipSW). These are still recognised qualifications for those returning to the workplace, but all new social work students will now need to undertake the academic degree with integrated work placements. 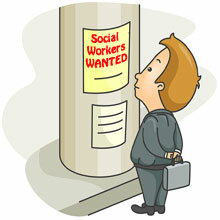 Is There Much Demand for Social Workers? Knowledge and understanding of the law and legal procedures will be important as a social worker and while this will be covered in training, any previous experience will be a bonus. Bear in mind that whatever skills you have, you will still need to complete the academic course and placements. As you progress through your career you will receive ongoing training. All social workers in the UK, register with the Care Council and will need to re-register with them every 3 years, completing any necessary re-registration training in order to do so. Career development in social work tends to veer towards developing a specialism, for instance working with the elderly, in the foster care system, or with drug abusers etc. Through additional training there are also opportunities to enter more managerial and team leader positions, or even as a teacher, lecturer or political consultant. A social worker's salary will depend on experience and qualifications. Generally however, a social worker can earn from £20,000 up to £40,000. Management roles will earn you up to £60,000, with senior management roles earning beyond £70,000 for a 37 hour week. Working in social care can be extremely challenging, stressful and heavy workloads are common. However often the emotional rewards and contributions made to individuals, communities and society can outweigh the stresses and strains. The idea of returning to study or training to become a social worker (especially if it's a while since you left college), can be daunting at first, but you can do it! Have a look through Returning to University to find out what is involved. Hi, I am nearing the end of an Open University Health and Social Care Degree. I havea Level 7 qualification for teaching and Assessing as well. I have worked in education for 18 yearsand have volunteered for Home Start and at a local older persons day centre. Can you please advise what the next step would be towards becoming an older persons social worker? Hi, I have looked at Frontline and Step-Up To Social Work. I looked at the 2:1 requirement and the Q&A on this. I got a 2:2 at art college in 1982. The answer to 'does a Masters count as a 2:1?' was 'no'. I have asked their help section whether my PhD, MA in Education and International Development (with distinction), and 30 years of experience in Child Protection in international contexts would trump the 2:1 line they have drawn. Unfortunately, they have not answered my inquiry. Would you be able to help here? I have a 2.2 bachelor of Arts degree, post graduate diploma and level 5 in management health and social care.I have over 10 years of practical and relevant experience to draw on plus lots of transferable skills.the only thing I don't have is Math's GCSE are there any uni's in the Uk who will accept a mature student on a masters course in social worker without Math's GCSE? We really don't know. The easiest way to find out is to contact individual institutions. They may also provide you with some suggestions for ways to get round this, or to fast track yourself through a GCSE course/similar maths qualification. I have a 2.2 bachelor of Arts degree, post graduate diploma and level 5 in management health and social care...I have over 10 years of practical and relevant experience to draw on plus lots of transferable skills....the only thing I don't have is Math's GCSE are there any uni's in the Uk who will accept a mature student on a masters course in social worker without Math's GCSE? I am currently a deputy manager in a nursery. Having my level 3 in childcare, leadership qualification and currently completing management course. I have worked with children who have mild aspects of behavioural issues and this has stirred me onto wanting to become a social worker. What would be my next course to take to further myself to the career I want. Hi, I have a 2:2 BA honours degree in early years and childhood studies. Am I able to apply for the stepping up to social work course or does this require a 2:1? What options would I have? I have qcf level 5 in management health and social care, as well as 7 years experience running a 7000 hour a week domicilary care agency as a registered manager would this be deemed the equifilient qualification to become a social worker ? When you choose your GCSEs, not that a social work degree requires aminimum of 5 GCSEs A-C, including maths, English and science, and two A levels. At A level, there is no specific subjects requirement but if you check UCAS and the British Association of Social Workers etc, you may find certain A levels are more relevant than others. Hi, I’m currently looking to start an apprenticeship as a nursery nurse but would like to be a social worker at some point. Would any qualifications I gain as a nursery nurse help me become a social worker? You would need to start with at least some academic qualifications, ask at your local college to see what part time A level or relevant NVQ level 3 courses are available. Once you've completed these you can look at the various ways to become a social worker. Just like kaptaink, based on their comments pasted below, I have several months of support worker experience in mental healthcare among other public and private sectors experiences, and would really love a total career switch to social work, subject to being accepted on an MSc/MA SW course. I have a non-social work 2:2undergraduate awarded in 1998 plus a 2008-awarded master's (both humanities based and didn't need a GCSE grade C Maths to be accepted, which I don't have anyway). Kaptaink, could you please be a bit more specific about the Russell group University that accepted you on the MSc SW course? I would also welcome from all - any advice on similar universities that could consider me or on other options available. Thanks. Kaptaink's Comments: 'to everyone posting here who got a 2:2 in their undergraduate degree and have been put off applying for a Master's - don't be. I took a 2:2 for a degree in an unassociated field (an arts degree) and didn't have maths at GCSE either but I got a place at a Russell group University on a MSc SW course. The deciding factor was my work experience which was eighteen months as a support worker with a community mental health team. Alongside this I wrote a good application, had good references and gave a good interview and now I'm a qualified social worker. Don't write yourself off because you have a 2:2 - if you've got what it takes and have a degree in any subject and of any class you should be able to find yourself a place on a suitable course. Getting funding is more likely to be the real challenge these days'. Hi, any universities still offering the option of a further year of study converting the DipSW into a degree-level qualification? Thanks! Hello, I wonder if someone could answer my question. I have 20 years experience in Early Years and am an Assistant Manager in a setting. I have just received a 2:1 in a (BA) hons degree in education. But, am interested in becoming a Social Worker. What extra qualification would I require, please? You would normally need to take an additional social work qualification such as a degree in social work. There are some programmes like Frontline where you can qualify on the job - you will need a minimum of a 2:1 in your undergraduate degree. Hi! I would like to study to be a social worker. I have the relevant GCSEs, NC in Social care, HNC social care and a HND in additional support needs managing and supporting. I also have 4 years of paid employment as a social care officer and 3 years doing placements during my college courses. I am wondering what the next steps are. Hi, I'm interested in transferring into a carer in social work in the future at some point. My story is that I have the necessary GCSEs and 2As and a B at A-Level. I was able to study Sociology at the University of Nottingham, a Russell group university, but due to genuine personal circumstances, I graduated with a third. I've done a lot of volunteering in a variety of areas, directly as a teaching assistant, at a youth organisation for children with neurological disorders and as the NEET Drop In Centre. I'm currently working in a clerical position at a office and want to become a social worker in the field of offending/rehabilitation and youth offending. I am aware that due to my degree classification that I cannot do a MA in social work etc. I'm planning on doing a B.A Social Work through the open university and know I will have to pay outright. My main question is regards to sponsorship. If I continue to supplement myself with volunteering in the prison sector, youth offending etc. Are there any organisations I can get in contact with who will help organise a placement etc. I've seen it mentioned on the page that it is required. To everyone posting here who got a 2:2 in their undergraduate degree and have been put off applying for a Master's - don't be. I took a 2:2 for a degree in an unassociated field (an arts degree) and didn't have maths at GCSE either but I got a place at a Russell group University on a MSc SW course. The deciding factor was my work experience which was eighteen months as a support worker with a community mental health team. Alongside this I wrote a good application, had good references and gave a good interview and now I'm a qualified social worker. Don't write yourself off because you have a 2:2 - if you've got what it takes and have a degree in any subject and of any class you should be able to find yourself a place on a suitable course. Getting funding is more likely to be the real challenge these days. Thanks for sharing this information with us, that's really useful to know. I have been working in Customer Service / Contact Centre division with reputable companies for last 17 years and have grown stage by stage with experience and knowledge. I have wealth of experience working forprivate and public sector organisations. My background in Operations Management, Customer Service, Account Management, Vendor Management and Technical Process Management represent a unique combination of disciplines. Personally, I have the drive and determination to consistently achieve success and have the urge to keep learning as life is a continuous process of learning and excelling. My motivation for a career change came about from my past experiences growing up. During my adolescent years I both witnessed and experienced families in crisis. This had a profound effect on me and after a process of soul searching as to the best use of my skills whilst at the same time satisfying a need to give something back, I plan to move my career into Social Care Work by working on a supporting role such as commissioning or workingin the sector for a provider. However deciding is different than acting and that’s the reason for me to be stuck not knowing what’s the first step, as do not know the right way of pursuing this dream / goal. Hi, I am an assistant principal in a state secondary school and have subject specialisms in PE/Health & Social Care and I am interested in how difficult it would be to convert to social work? I currently have a huge workload and know that would not change but need to know the impact on earnings?